December 23, 2017: Year 2018 soon arrives and GOP politicians and their donors are already looking ahead to the 2018 Midterm Elections scheduled for Tuesday November 6th. Of course, it's too early now to say how hacked or rigged the votes and outcomes will be but we know at least one US political party that will do everything in its power to sway results their way, if at all possible. As usual, a large voter turn-out can make cheating more difficult so hopefully such will be the case even though GOP gerrymandering will be doing what it can with a few Democratic Party tricks in the mix as well. Obviously, many political rallies and other events will occur between today and November 6, 2018 including scandals, subpoenas, and leaks. Various conditions will change for better or worse--including the just-signed GOP-Trump 2017 Tax Cuts and Jobs Act (with Mercury Rx!) which will have been in force for months by November 2018 and its results will affect public opinion positively or negatively. Still, let's take an early peek at the planetary influences and themes of the Prenatal Solar Eclipse and its Saros Series (2 New North) in which General Election 2018 falls. You may wish to follow the link, above, for details on which states and seats are in play, plus, other details as they are currently known. Image: August 11, 2018 2 New North Solar Eclipse @18Leo41 5:57:39 am edt Washington DC; Hour of the Moon (fluctuations, changes); Ascendant 13Leo44 so the Sun is chart-ruler but makes no major applying aspects. 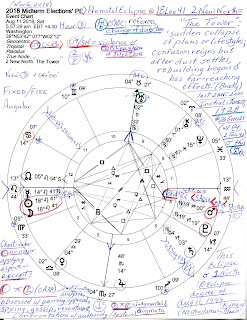 However, there is an inconjunct (quincunx) with 6th house Pluto @19Cap19 Rx (0A38) denoting potentials for justification, analysis, obsession with gaining approval, spying, gossip, resentment, and confrontations with authority--and adjustments must be made concerning the power principle (Pluto) and egocentric aims (Sun). Also note that a Moon-Pluto inconjunct suggests judgementalism and dogmatism (Epstein). Is Trump Tower part of 'The Tower' Eclipse picture or does its theme of 'collapse' relate to the Republican Party--or perhaps to the US government itself? With the current crop of infiltrators working hard to hollow out America's halls of power and considering foreign interference in our business, I'd not care to express my deepest thoughts on this topic at the moment although I'm certain you have ideas of your own, dear reader. Now as you know, in 1999 and into the New Millennium, it was George W. Bush playing the role of the 'king' (POTUS) of America. But in 2017+ it's you-know-who, born with royal Regulus, the 'king' or 'king-maker', rising along with his thin-skinned, confrontational Mars in Leo. However, like all royal stars, Regulus contains a serious caution: success if revenge is avoided. Now who can say that Donald Trump isn't a champ at revenge and retaliation? Yet if this cosmic caution is neglected or ignored, all that has been gained will be taken away. So as you see in the chart, disruptive Uranus @2Tau33 Rx has just crossed Midheaven, the Goal Point, which denotes 'reforms and changes of direction in career and matters of public status'. Now I won't add my own intuition that Democrats may take back enough seats in Congress to change the balance of power on Capitol Hill, or at least to toss a wrench into Trump's and the Republican agenda, but it's something to ponder and work toward, isn't it? After all, maverick planet and anarchistic zealot when in Aries, Uranus, suggests that 'premature actions lead to failure' when the 'Sky God' is in Taurus. 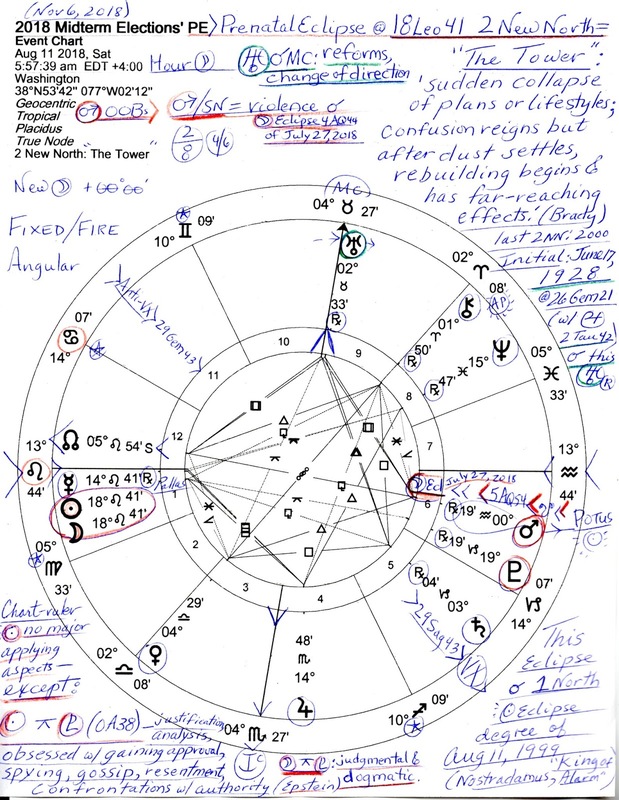 Plus, Uranus is Mr. Trump's guiding planet due to its oriental condition in his natal chart (10th house) and seems to inspire the chatty tweets (Uranus in Gemini) of his very thoughts directly at the public, however unvetted, untrue, odd, duplicitous, and/or disruptive they may be. Well, there are many more chart factors in the above horoscope worth discussing and my aim is that you may do so 'amongst yourselves' for there are children about the place here, gifts to open, and a holiday to celebrate so I'll mosey along for now and check back with you later. Related Posts: Eclipses and a Few Other Cosmic Events of 2018 and The Natal Horoscope of Donald Trump Part 2 with a link to Part 1 and notes on his Prenatal Solar Eclipse @9Gemini which repeats on July 13, 2018 @21Cancer amidst the Twin Stars of Gemini. Plus, this post on The Tower Eclipse is actually the second one published. If you wish to check out my first version, tap or click this link.